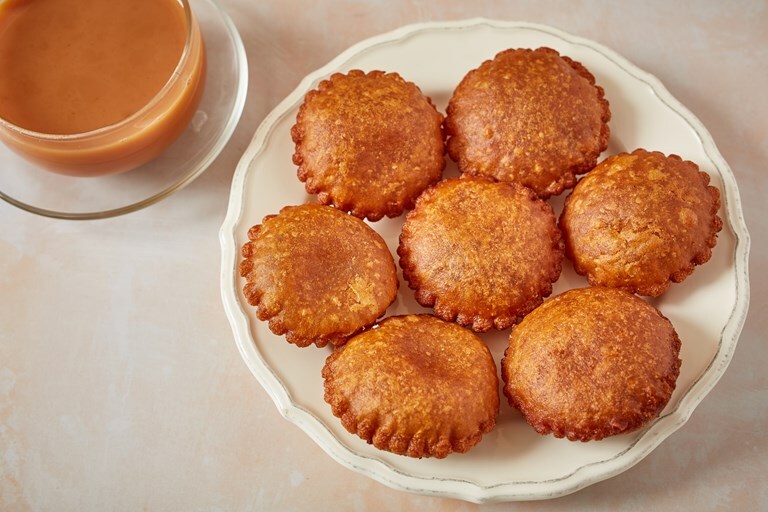 Handesh are a popular sweet treat throughout Bangladesh, comprised of little more than date molasses and rice flour. They're typically served during holidays and celebrations, and are one of the many pitha (rice-based snacks) enjoyed in the country. For more authentic Bangladeshi recipes, check out Dina's other dishes here. Handesh are delicious fried rice flour cakes, also known as teler pitha. They’re a real celebration of rice and morcha gur – the exquisite date molasses made in Bangladesh during the late autumn and winter months. These cakes belong to the tradition of rice-based sweets and savouries called pitha, which are key to Bangladeshi food culture. Weightier than a doughnut, handesh are slightly dense and crispy around the edges. The secret is in the preparation and to me there’s magic in the making. I still feel excited when I watch a pour of batter disappear into the hot oil, dark against the traditional cast-iron pan. The batter rises and puffs up and a tiny frilly edge appears (synonymous with good handesh), and finally takes on a deep copper hue. I grew up eating these during the Muslim festival of Eid and special occasions such as naming ceremonies and wedding festivities. During Ramadan you’ll find handesh being fried on the roadside in giant pans, wrapped up in newspaper to take away for the breaking of fast. This recipe is inspired by my mother, who is renowned for her traditional pitha recipes. Serve hot with a cup of spiced tea, for a traditional Bangladeshi treat. Date molasses is available in Bangladeshi grocery stores, but if you can’t find any you can substitute it with jaggery, readily available from Asian grocery stores and large supermarkets. Just chop into small pieces and gently bring to a low simmer until the jaggery is melted and cool to room temperature before adding the flours. You may also need to add about 3–4 tbsp extra water to the batter as jaggery is very dry.